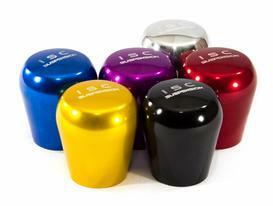 ISC Suspension Shift Knobs UNIVERSAL - Dezod Motorsports Inc - Home of the automotive performance enthusiast since 2002. Represent your favorite coilover inside your car with the ISC knob! Made of anodized aluminum this knob gives a better shift feel and compliments any interior theme your vehicle may have. Even better, ISC Shift Knobs are offered in three distinct configurations to suit and driving style! The ISC Comfort series knob is our most popular knob. The perfect round shape is ideal for the natural contour of your hand. The Race series ISC knob is ready for anything you can throw at it. With a massive lateral surface area this knob can make fast shifting more precise and accurate. The Sport series ISC knob is a hybrid between the design of the comfort and the Race series. Still easy on the hand but has a bit of a flat top for quick precise shifts.